The only two sure things at the top of the bracket are Syracuse and Kentucky getting 1-seeds. After that, 6 teams are battling for 2 spots. For the moment, Big 12 leaders Missouri and ACC leaders Duke get the other 1-seeds. On the S-curve, Marquette came in 9th overall and is the top 3-seed. To move up between now and Selection Sunday, the minimum the Warriors would need is a 3-1 record in their last 4 games and an appearance in the Big East title game. But that would also require other teams to slip up. I'm confident that if MU won their last 4 games and followed that up with a Big East tournament title, they would be a 2-seed. While the teams ahead of them (outside of Syracuse and Kentucky) all look very solid in their positions right now, it's unlikely that all 6 of them will both finish top-two in their league and get to their title games. 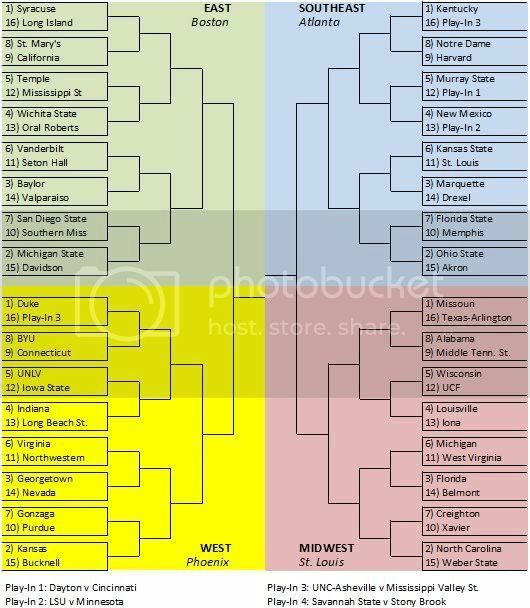 Regardless, Marquette is solidly looking like a 2 or 3 seed and in very good position as we move toward March. For the first time, the Big East leads the way with 9 bids and the Big Ten is second with 8, thanks to Cincinnati moving into the field and Illinois crashing out.